I played a LOTR at Expo this year and noticed that there was a light in the ring hole (where the ball disappears from the playfield on the habitrail). Mine doesn't have a light in it. I've tried to figure out if there is a bulb somewhere that is out or if there may have been a spotlight modded on the Expo one to show the hole or what. Would appreciate any info from LOTR owners or those familiar with it as to if the hole is supposed to be lighted and if so, how? I believe mine has a red flasher on the back panel. 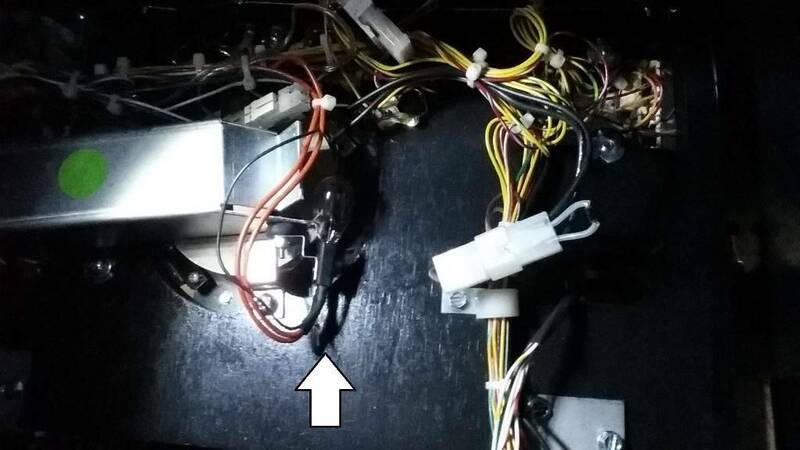 There is a 906 flasher that is mounted behind the playfield on the back side of the ring. you need to lift the playfield to get to it. I never realized there was one there! Mine must be broken. Something to check out tonight!!! This topic should be a sticky. That bulb takes such a beating, it's almost always dead, and LOTS of people don't know there's supposed to be a bulb in there. It's a perfect place for an LED flasher. Yes great place for an LED flasher. While your back there check the flasher on the other side of the backpanel for the tower Eye. I replaced that with a led flasher as well. It flashes with the spinner, so it takes a beating. I put the cointaker 5 sided in mine, and haven't had a problem for well over a year. I put a 9 led blue flasher in mine from PBL. Had to slightly modify the socket holder so the light points directly at the ring. It looks awesome! Happens all of the time. I had mine for months before I realized it. The bulb just got knocked loose, put it back in place and was good to go. Like others, I had mine for 6 months before I knew there was a flasher back there. Red is my color of choice, but any color is better than none! Yep, just replaced my burned out one with a CoinTakers LED. What?!? I never knew this either. I will have to dig threw my LEDs to see if I have one. If not, I better order one. This would really add to the game. This would really add to the game. Wait until you add an external subwoofer and get that spinner going. Great effect! I found that my LED will still shake loose often but does not burn out like a traditional one. I used white - I dig it. I added an internal one from pinball pro. Well worth the $100. I don't know if I could handle an external one. I don't know if I could handle an external one. Sometimes I can't -- especially when the ball spends time in the pops. But MET with the external subwoofer -- I leave with my ears ringing I have it cranked so loud. Should probably get the shaker to top it off. F#ck! There is a flasher in the there?!?!? The 5-sided flashers work great for the 3 pop bumpers (red LED to match the domes) as well as behind the ring and behind the right tower (whatever color you like). You have to pull the playfield out to the supports to see the flashers behind the ring and tower. The ring flasher is on the left side of the ring (player's left side). thanks for all the responses...I will check it out tonight...I had raised the pf before and found no light socket back there, only the magnet....will look again. Thanks for the info. Wouldn't a directional flasher work best since it is to the left of the ring and then projects only to the right? just changed out the 906 since I don't have any LEDs around that fit (only bayonet GI LEDs on hand)...what a difference. Never knew it was there...many thanks to the guy that was selling the LOTR at Expo all working and made me think of it...I will be getting an LED for it soon. A directional LED will only work for the ring if it is adjustable such as a 12 volt flex LED. I tried one of the Pinballlife 906 LEDs that have the end facing light output and that did not direct enough light to the ring. The 906 version likely will work well. Make sure you use some hot glue or something to hold the bulb in place. Especially with an LED bulb, the magnet has a tendency to pull it out after a few games.